In 2015, Birdy Tg decided to stop all kind of Exhibitions for the 3 coming years to exclusively concentrate on his new books and new visual series (he just kept his main retrospective show that were scheduled for a long time). He will exhibit again from the second part of 2018. “…Birdy Tg’s style is very unique and strong, escaping to all traditional classifications, far from what is usually given to see in the nowadays tidal wave of images. Meanwhile, if a classification is needed, his photography could be described as Lyrical, Poetic, Oneiric, Allegorical and Romantic. He, himself, always describes his photographs as Visual Poems and Dramas. Whatever, we are in presence of a body of artwork, in no way coincidental, but extremely meticulous and thought, and which makes think. There is for sure the prime impact of the skill then always the possibility to dive deeper in Birdy Tg’s endless world… Birdy Tg uses a lot of different photography techniques, drawing and paintings that he patiently mixes in very large format frescoes. Some of his most recent works (in 2014) include more than 800 photographs in a single artwork which required over several thousand hours to produce. With no contradiction, there is in Birdy Tg, all of the fiddly profusion and the creative genius madness of Hieronymus Bosch or Richard Dadd, but also all of the German Romanticism, inside his palette, the lights ripping out the obscurity, the characters facing the elements and their own fears, the strong print of Literature and Philosophy, of the Irrational and the Utopia… It’s certainly not a hazard if Joseph Anton Koch and Birdy Tg, both, give worship to Dante Alighieri and his “Divine Comedy”, if Birdy Tg Pays homage to Eduard Biermannn with is work “Salvation”, if we feel so well the Caspar David Friedrich ‘s atmospheres in many works like “A Secret Universe” or “The Secret of Cloud Cities” … One can’t do otherwise than thinking about the “Oeuvre Totale” (“Total Magnum Opus”) concept so close to Philipp Oto Runge’s heart when Birdy Tg champions a visual art work which makes one and only one with his music, his writing, his painting, his sculpture in lauding: “Art is One and Indivisible. All is One and one is All” (Birdy Tg – 2014). It’s also very interesting to notice furthermore than Birdy Tg’s work often refers to numerous German Artists as the expressionist Franz Von Stuck to whom Birdy Tg pays tribute in “Eine berlinische Nostalgie” (“Remember Berlin” Serie), or the Sculptors Rudolf Belling in “Drawing the Line” (“Time Flies” Serie) and Waldemar Grizmek for who he devotes the “Ages of Life” full Serie. 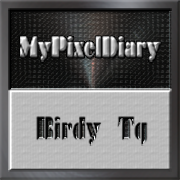 Birdy Tg’s artistic expression is definitively modern and contemporary. I personally have the feeling that he could tackle any style, making it His Style, with verve thanks to his obvious wide artistic culture. This is precisely what I had the chance to confirm when I recently saw for the first time his new Serie: “In the Garden of God and the Devil” in which I discovered brand new art works in which he has mixed with success and no contradiction at all, so many different styles together as Baroque, Caricature, Surrealism, Minimal Art, in the most natural way. There is this permanent ferment, this incessant renewal, this constant fresh air, this perpetual questioning, this endless risk-taking and meanwhile this undisputable style homogeneity. Everything hit the target, as it happens.